If there was a bumper sticker about braking for art exhibitions, I might be tempted to put it on my little red Mazda. I love travel and I love visiting new art museums and galleries. Anticipation is half the fun, so I pour over the art show listings in the local, national and international press. In the next year, I have a couple of art trips planned already. On the home front I would like to see the private museum of Bob Rennie, which is opening in Vancouver this year. Apparently, it is by invitation only, but I'm sure if I keep my ears open some well-connected friend will be going and I can tag along. His collection tends towards the conceptual, but I am interested in seeing art that has been selected and curated by the tastes of one person. I usually see at least one show in the States, and this year it will be Richard Diebenkorn: The Ocean Park Series, 1967 to 1988. This show will be on at the Orange County Museum of Art beginning in April 2010 and running until early September. Apparently it's so far in the future it hasn't even made it to the museum's website yet. I love the structure of the Ocean Park paintings, and his delicate use of colour within that repeated composition. I am also intrigued by the way that Diebenkorn has rotated between representational and abstract works during his career, like another artist I admire: Gerhard Richter. A study of art and art history can result in derivative paintings without conscious intention. One painting I did drew several comparisons to Richard Diebenkorn, and although it was unconscious on my part, there was a definite similarity. Sometimes, as I work to resolve a painting, whatever seems right may actually be something familiar. To avoid this, I use a tearing process I cannot control that creates a random quality in the work. Still for the visual mind to be completely new is difficult in our image-filled age. ... and here's my painting entitled "Lines Revealed". What do you think? 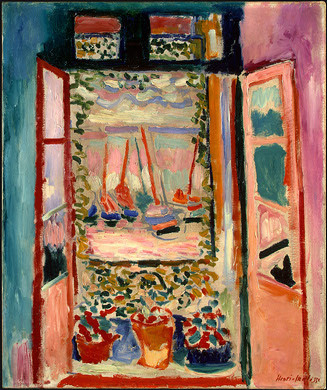 But what is also interesting is that Diebenkorn was initially inspired by the composition of Matisse's "Open Window, Coulliore" to create the Ocean Park series in the first place. 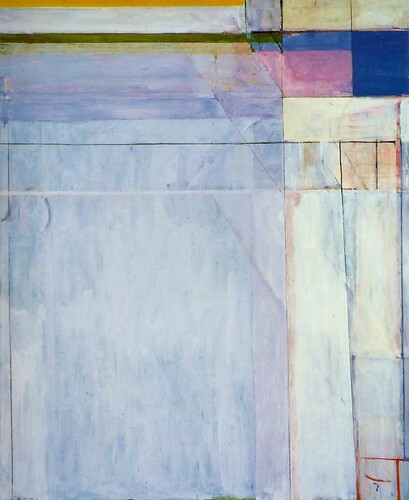 Clearly Diebenkorn has evolved the composition to something quite different, both by hard work (there are over 140 paintings in the Ocean Park series) and by experimentation with colour and abstraction. In the hands of a great painter, inspiration plus hard work equals masterpieces. I am greatly looking forward to seeing the paintings in person.